A green monolith standing against the tide of un-sustainability, It is essentially tasked with feeding the vital yet most often overlooked needs of the modern urban citizen. It attempts to humanize the urban scale while urbanizing the farming scale. 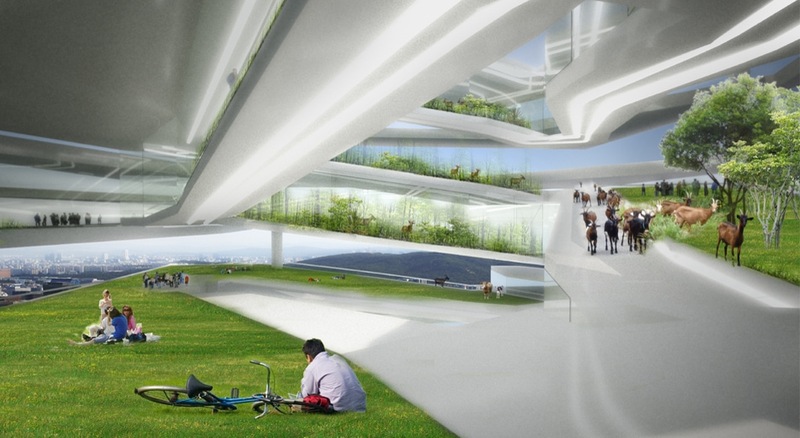 It creates and distributes power, farming the abundant yet untapped wind and solar resources of the city of Seoul. It answers to the need for clean air, clean water, fresh locally grown food without pesticides and perhaps most importantly a public space within which to share them. 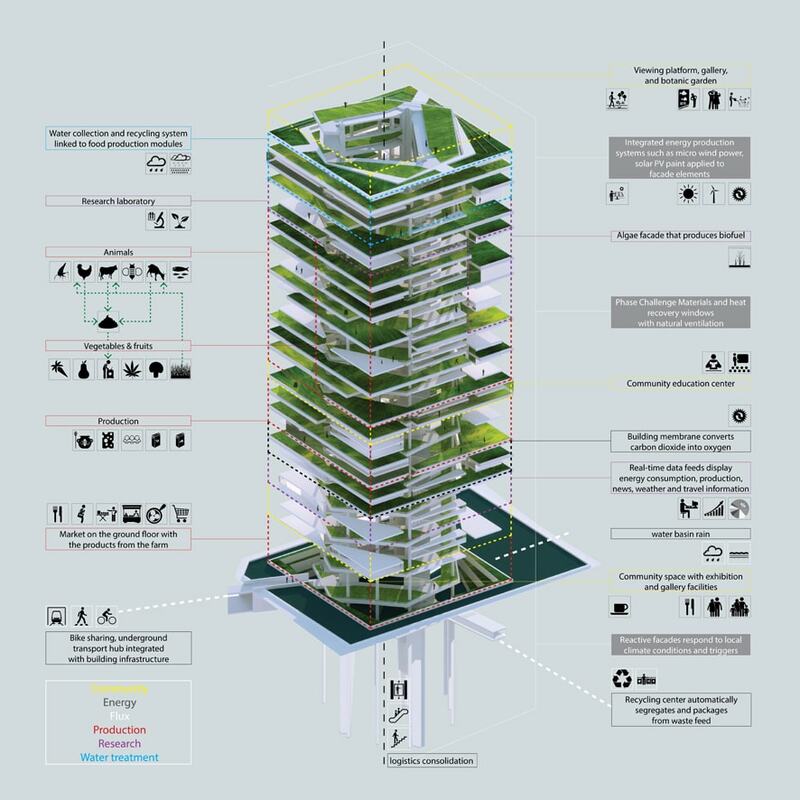 The self-sustained nature of the vertical farm’s functions when paradoxically made to function together as a whole can readily be compared to those of a human social network, projected to cultivate not only a source of nutrition and power but a growing sense of community. It is about taking our cities off of life support and give them the self-supporting autonomy. 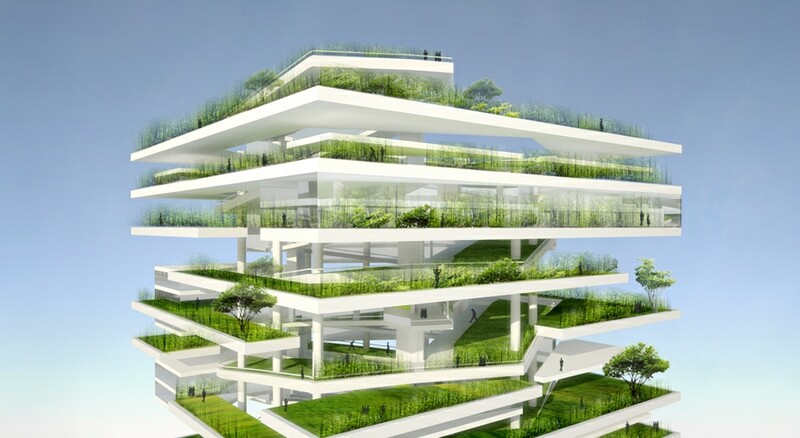 Project – Vertical Farm & Botanical Garden | Site – Cheonggyecheon-ro, Seoul, Korea | Site Area – 20,120 sq.meters | Building Area – 65,000 sq.meters | Gross Floor Area – 10,000 sq.meters | Building Coverage Ratio (%) – 50% | Stories above Ground – 80 stories | Stories below Ground – 4 stories | Structure – Wood and concrete structure | Height – 300 meters | Landscape Area – 70,000 sq.meters | Parking Lot – Underground automated parking | Exterior Finish – Micro-Algae bioadaptive façade and prestressed Carbon – Dioxide absorbing concrete skin held by steel structure. 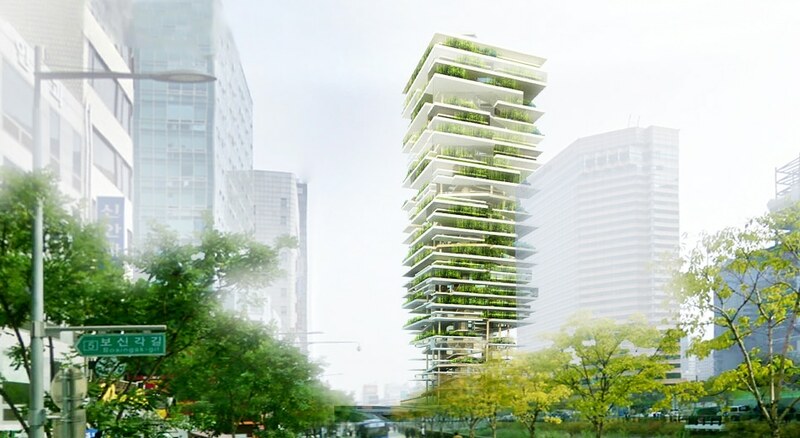 Vertical Farm is about an agriculture tower that will grow and care for all sorts of plants, like rare, organic vegetables and fruits as well as flowers. 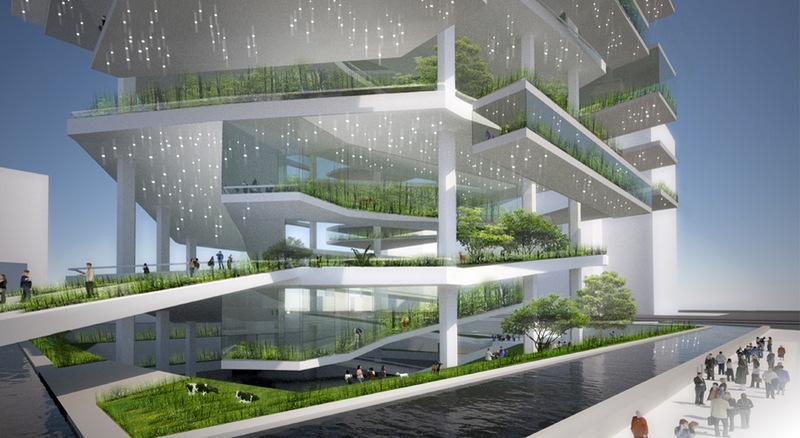 It has a Vertical farm which is a new agricultural technique. 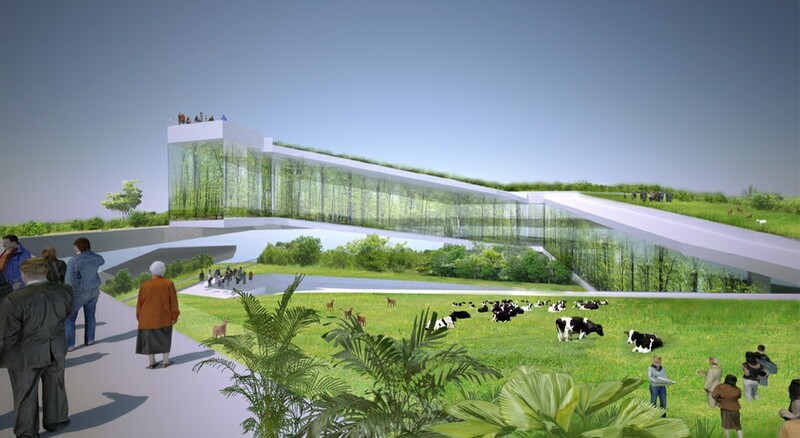 The vertical farm is a good idea that automates the production of food in a more sustainable manner, by reducing waste, pollution and carbon emissions. Also, it will have a gallery, market, restaurants, shops, academy and labs. These green ideas are focusing on the ecofriendly products and green building technology, efficient food, water and energy production and usage, sustainable designs that could create a new reality and improve green living conditions. Hypothesis | The world’s population is expected to increase to 9.1 billion by 2050, according to the UN. Feeding all those people will mean increasing food production by 70%, according to the UN’s Food and Agriculture Organization, vertical farms will be a good solution as well as planting more plants. Also, we have a lake of organic healthy food. A lot of people doesn’t know how to plants their own food. Aim | It lets people to focus on healthy, organic food bought locally, the demand is even greater to bring food production closer to the city. As well as it will not only help in curbing the problem of growing population but also create green spaces in urban area to check the carbon emissions. Objectives | Vertical farms will rely solely on hydroponic organic farming techniques, which means no pesticides, synthetic fertilisers and no pollution injected into waterways. / Water for irrigation will likely come from treated rainwater, Grey or Black water. And water use can be significantly reduced by recycling water and through the efficient use and reuse of water inside the farm / It will have many eco-benefits for both the surrounding region and the planet / It will be designed to provide space for a sustainable research centre and eco-friendly living spaces for permanent workers and visitors.